Humour is always one of the hardest thing to grasp when moving from one culture to another. And then even harder is trying to explain it. Kiwis have a great sense of humour. It is subtle, very ironic. It definitely has links to English humour but has developed its own slant. It’s also undeniably different to Australian humour, which is a lot more blatant and brash. And of course in real Kiwi fashion, it’s often defusing, used to avoid conflict and calm the situation. 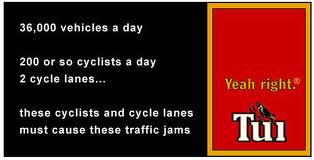 This appeared around the discussions on blaming the current trend to create a safer cycle environment for the traffic yams in Auckland. Some other classics are: ” I’ll call you”, “I’ll do the dishes after the game” and ” Dad’s new husband seems nice”. Dutch humour is impossible to explain, mostly because it depends so much on knowing the language. It does have irony and sarcasm in common with the kiwis though. And no, I am not ending this statement with “yeah right”! This entry was posted in A to Z challenge and tagged humour, irony, kiwi, nz, sarcasm. Bookmark the permalink.